Life's little more than one great big circle, really. Take Wolverine for instance: the man's spent most of his adult life uncertain of who he is, where he's been and what he's done. Logan didn't even know he had an adult son, Daken, until recently. And while the kid doesn't accept his old man's excuse that years and years of brainwashing and torture have robbed him of his memory, that might be about to change. 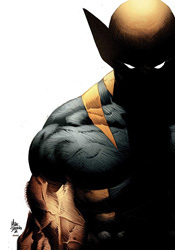 The two have come to blows repeatedly since finding each other but now that Daken, in captivity, has forgotten his own name, it seems father and son may have finally found something in common. While this storyline with Daken has drug on for what seems like ages, Daniel Way's writing has constantly found a way to keep the character (and his strained relationship with his father) fresh and unpredictable. Every time I start to think he's overstayed his welcome, Daken's story replenishes itself, with the most recent twist being this sudden bout of amnesia. Was the gimmick necessary? Not entirely, but it does add an interesting new dynamic between the two, and that's good enough for the time being. This long arc does need to start thinking about wrapping itself up in the near future, but for now it's still got a bit of gas left in the tank. Whether Way is content to keep driving until it creeps to a halt on the side of the road remains to be seen. Mike Deodato's art is quite moody, shadowy and atmospheric, but he works with such detail that the ongoing narrative is frequently in danger of being lost. His characters carry enormous weight, almost to the point of distraction. Logan looks and feels like a short, stocky warrior, and when he recalls his final battle with Sabretooth in a flashback, Creed may as well be the boogie man. He's treated so ferociously, towering several feet over Wolverine, that it pushes the boundaries of good taste. Does it make for a striking visual? Absolutely, but it's also so close to the line between believability and imagination that it threatens to pull me out of the moment. Deodato's style immediately gives this arc an entirely different tone and flavor than the series had enjoyed under Steve Dillon's watch previously, which suits the sudden change in the dynamic between Wolverine and Daken. The issue is fogged over by a much darker, more complicated atmosphere, and that's as much a result of the change in artists as it is the revelations in the storyline.